Volunteering in the Amazon region of Ecuador is one of the most exciting options, offering an unequalled opportunity to be able to explore and learn about this incredibly biodiverse region of the world - the so-called "Lungs of the Planet!" We are partnered with a variety of communities and local grass-roots organizations that are working to live sustainably and manage their local resources for future generations. We offer opportunities to volunteer in education, child care, health and medicine, community development, construction, animal rescue, reforestation and conservation in the Amazon rainforests of Ecuador. "I have always dreamed of visiting the Amazon rainforest and I am so thankful to Yanapuma for organizing my volunteering with this community. During my month there I learned so much about life there and will never forget my experiences - the stunning environment, the noise of the insects at night, and the friends that I made!" The Amazon - Climate and Seasons . . . 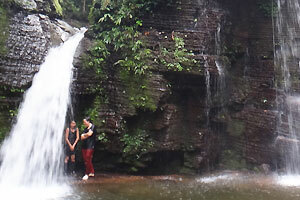 The climate in the Amazon rainforests of Ecuador is generally hot and humid as would be expected. Daytime temperatures average 28-33 degrees, but can rise to over 40 degrees on occasions. Humidity varies from 78% - 88%, and it is the high humidity that can make the Amazon jungle feel oppresive and airless more than the high temperature. Night time is usually a good few degrees cooler, especially when it rains, making it generally not too hard to sleep. The rainy season may vary between locations, depending on local geographical factors, but generally the wettest months are from February to May. However, often it rains mostly at night, so there is not really any better or worse time to travel to the Amazon. We are partnered with a variety of community projects and grass-roots organizations in the Amazon region, based around the jungle towns of Tena, Puyo and Macas. Some are indigenous communities while others are local organizations devoted to sustainable development.